This recipe is probably has two big differences from most of the recipes you have tried. Together they make incomparable hummus, in my opinion. 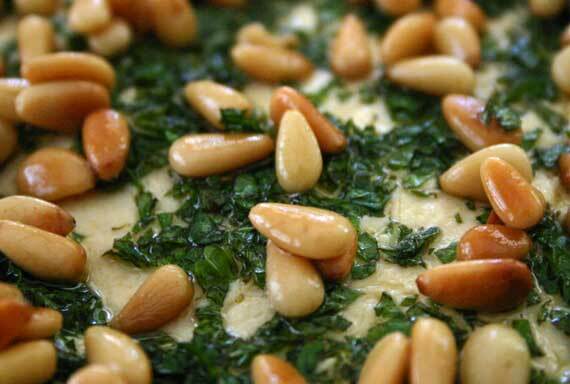 Second, instead of adding parsley (or not), this version uses a topping of toasted pine nuts and chopped mint. Lovely! Make the hummus in the food processor. Also, I use canned garbanzos, but you can cook them from scratch if that’s your preference. Run the food processor until mixture is smooth. Dump onto serving platter and spread to make a relatively thin layer (say about a centimeter thick). For topping, take a handful of pine nuts and toast them gently in a skillet. You have to watch the pan and stir to turn over the nuts as they will burn if you turn your back even once (well, almost). Set aside to cool. I usually do this before I start assemble the ingredients in the food processor. Take a bunch of (spear)mint. Wash and drain. Pinch off leaves and pile them into a stack, then slice into narrow shreds. Cross-cut the pile once or twice to make the pieces shorter. Mix with the cooled pine nuts and spread across the top of the hummus on the platter. Drizzle with a bit of olive oil, if you like. The hummus is good with toasted pita wedges (easy to make in the oven), fresh pita, and even water crackers. >>> Kyle*-style: instead of the mint/pine nuts topping, do a fine sprinkle of smoked sweet paprika along with the light drizzle of good olive oil. The smokiness is heavenly with the hummus. * I came up with Kyle-style when Kyle and Rachel were here and I didn’t have any mint and wanted to get the dish on the table quickly.